SPRING GROVE VILLAGE, Ohio — Stan Wernz will be Abraham Lincoln on Memorial Day at Spring Grove Cemetery and Arboretum . He has portrayed Honest Abe without a script thousands of times since a young student first noticed how Abe-like Wernz was. Those who gather at 12:30 p.m. Monday in the cemetery’s Civil War section will witness one of the country’s premier Lincoln presenters quote from great speeches, wax patriotic and answer questions from his curious and captivated audience. “I arrive in character and stay in character unless the host or hostess asks me to break character to answer certain questions. Anything about Lincoln is fair game,” said Wernz, a resident of Wyoming who at age 80 is hobbled from surgery, but still will stand tall in his stove pipe hat – just like Lincoln. He said he expects to field some challenging questions like he always does. It is safe to say Wernz was destined to portray Lincoln. He was born on Lincoln Avenue in Mount Healthy and grew up in a farming neighborhood in Springfield Township, which shares the name of the great president’s hometown in Illinois. Wernz majored in vocal arts at Miami University and earned a master’s degree at the University of Cincinnati College-Conservatory of Music. He taught music in North College Hill schools over a long career and plays several instruments, including the piano and organ. But the greatest attributes he brings to his Lincoln presentation are his vocal ability, his facial features and, of course, his beard. He recalls shaving it just twice since that fateful day he became Abe in 1969. “In the early 1970s, my wife was in the hospital and she asked me if I would shave because (the medical staff) might think that I was a hippie and wouldn’t give her good care,” said Wernz, who since 2005 has served as president of the 150-member Association of Lincoln Presenters. “In 1983, I interviewed for superintendent jobs across the state. Up in a Columbus, a man with the Ohio School Board Association gave me the advice to go home and shave my beard. After the next three interviews, I was called back twice and offered a position from two of them,” Wernz said. Wernz said used to portray Lincoln up to 150 times a year, but has been slowed this year. Though he may lean on a crutch Monday, he’s still able to get out and garden in his yard. Wernz said he tries to add a new part to his repertoire every year and caters his Lincoln content to the crowd. Sometimes he is Lincoln the lawyer. Other times he is the president beleaguered by the Civil War. And when he presents to children, he takes them back to Lincoln’s childhood in rural central Kentucky and Indiana. At Spring Grove, he will deliver most of the speech he gave to the 166th Ohio Voluntary Regiment when it passed through Washington, D.C., in 1864 as well as portions of an 1838 speech he delivered at age 28 to the Young Men’s Lyceum in Springfield, Illinois. Perhaps he will tell the story of when he (Lincoln) visited Spring Grove Cemetery in 1857 or how Lincoln crossed Fourth Street in downtown Cincinnati to approach and speak with a common-looking man who was gardening. It turned out that man was none other than the second richest man in the country, Nicholas Longworth. 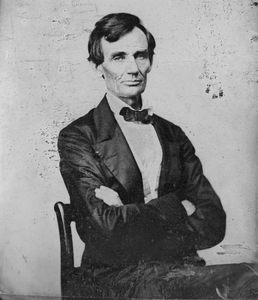 Abraham Lincoln visited Spring Grove Cemetery in 1857. Wernz hopes his presentation will show the dignity and humanity of an everyday man who led our nation during its darkest hours, the 1861-65 Civil War. “Lincoln was one of the people. He didn’t put on airs,” Wernz said. Wernz won’t either when he portrays the 16th president of the United States on Monday. “Soldiers: I suppose you are going home to see your families and friends. For the service you have done in this great struggle in which we are engaged I present you sincere thanks for myself and the country. “I almost feel inclined, when I happen to say anything to soldiers, to impress upon them in a few brief remarks the importance of success in this contest. It is not merely for to-day, but for all time to come that we should perpetuate for our children’s children this great and free government, which we have enjoyed all our lives. I get you to remember this, not merely for my sake, but for yours.